Check out the post “How Danny Dark Changed Commercial Voice Overs” on Dan O’Day’s blog. The video in Dan’s post of legendary PD Chuck Blore talking about how Danny Dark went from using his DJ voice to actually “talking to people,” is good advice for any of us who do voiceovers. I’m convinced that the narrations on the segments is one of the things that made me want to be a voice talent. Unfortunately at the time I posted this, the Time article lists “June Frees” as the voice of Rocky when in fact Rocky (and many other voices on the show) were done by the incomparable June Foray. Time likely was combining her name with that of Paul Frees who was the voice of Boris Badenov (and others). It’s always great waking up on a Monday morning with some voiceover projects already in the pipeline. Today, it was a narration for a home tour video for HighDefVideo Tours. Shortly after submitting the file for that home tour, I open my email to find another HighDefVideo Tour voiceover ready to be recorded. Then, an afternoon call from a client checking on my availability for the week of October 25th. All in all, a great way to start the week. I woke up this morning to news that Barbara Billingsley, or Mrs. Cleaver to many of us, had passed away at age 94. Like many, I grew up watching “Leave it to Beaver.” In fact, at one point when I was a kid, it was probably my favorite show. After seeing her as June Cleaver for so many years, it was hilarious to see her in this role. Rest in peace, Mrs. Cleaver. Tim's distinctive style and clarity provide an impact that commands a listener's attention. Tim's attention to not only the detail of the work at hand, but the overall need of the business shows a real customer focus. Tim's ability to skillfully complete a project shows his understanding of teamwork and project management. Having Tim on your project means you'll get a more than a casual effort to make your project successful. Don't hesitate to use Tim on your projects every chance you get. Working with Tim was great, fast & easy. Tim was a proven, hard-working and dedicated professional. Tim's attention to detail and timely handling of assignments made his work first-rate. I can recommend Tim without reservation. 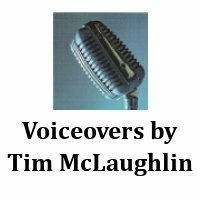 Tim, your voiceover work is terrific! Thanks for another great job!